Here is a set of Autofeed Paintball Loader shells that arrived today from Fabrice Bertois in France. These Autofeed shells likely date to around 1993-97 and I think I’ve seen these exact colors advertised around 1995. In this video they are shown empty, but I should have internals to fill them. This Autofeed loader opens on either side and takes standard pod lids as covers. I quickly look over these shells and talk about the internals that will go inside of them. 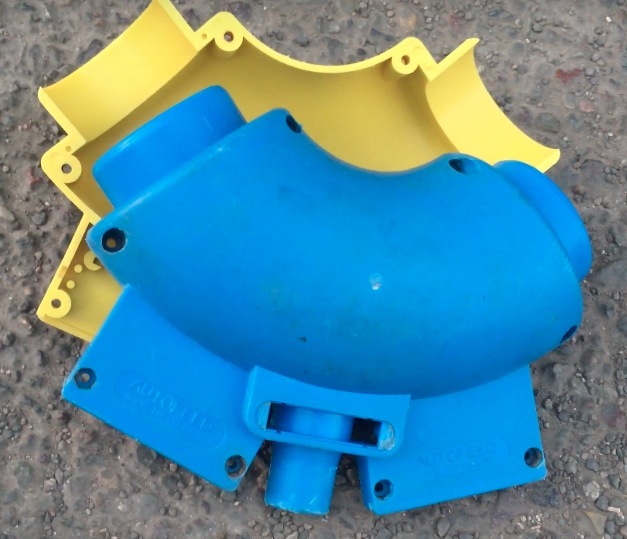 Autofeed loader shells with blue and yellow shells. These loaders functions almost identically to a 9 Volt Viewloader from the same period (before the Viewloader revolution). A look at one of the most bizarre paintball loaders I've come across, the E-Tron 130 Spin Loader from around 2000. A look at two Nasty Boys Paintball Loaders which date to the late 1980s and early 1990s. One style is unbranded and the other was likely produced by APP. A quick look at an original pump handle from Jim "Howdy" McGuffog's Termite pump. Christian Van Horn shows off a totally top of the line (c. 2000) Cobra LCD Angel with a single trigger and a purple to black fade.